Investors are almost as excited as fans about Friday's release of 'The Hunger Games' movie. 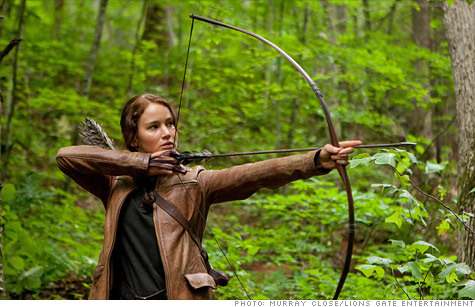 NEW YORK (CNNMoney) -- Teenagers love "The Hunger Games," a hot trilogy of books about to hit theaters. But the biggest fans may be from an older generation -- investors. Shares have soared so far this year for the companies best positioned to benefit from the opening of "The Hunger Games" movie this Friday. And analysts are saying they're all poised for further gains from the series. Lions Gate Entertainment (LGF), whose Lionsgate studio is releasing the film here and in many major overseas markets, has probably gotten the biggest lift from the post-apocalyptic story of teenagers forced into a life-and-death competition for the entertainment of others. Shares are up 74% so far this year after a gaining more than 9% this week. On Tuesday, the stock closed at a record high of $15.27. Analyst David Joyce of Miller Tabak, who Tuesday raised his price target for Lionsgate to $17 from his previous $14 target, estimates this weekend's domestic box office sales between $70 million and $90 million. Eventually he expects it to bring in at least $300 million in domestic ticket sales. "That's not quite Harry Potter, but I think it's going to be impressive," said Joyce. The final Harry Potter movie last year brought in $381 million in domestic box office for Time Warner (TWX, Fortune 500) on its way to global ticket sales of $1.3 billion. Joyce said that much of the run-up in stock is due to the company's recent acquisition of Summit Entertainment, the independent studio that has the Twilight movie series. The fifth and final movie in the Twilight series, which so far have averaged $270 million each in domestic box office, debuts this November. "I can't split how much of the gain is due to Hunger Games and how much is due to the Summit deal," he said. "But having Hunger Games helped Lionsgate get Summit to the table and get the deal done." The performance of Lionsgate shares so far this year would suggest financier Carl Icahn could be the big loser of the Hunger Games stock rally. Icahn and his son sold 44 million shares of Lionsgate last fall for $7 each, dropping a long-running battle for control of the studio. The buzz around the movie also helped lift sales of the books, which last week allowed publisher Scholastic (SCHL) to beat forecasts and its own sales target for the most recent period. Shares of Scholastic are up 25% year to date after gaining more than 4% this week. Company officials said even if last quarter proves to be a sales peak for the books, they expect good results from the franchise going forward. Analysts agree the first film and additional planned movies should help the book sales for years to come. "Unlike the Harry Potter series, for which the book release event drove sales, in this case, 'The Hunger Games' movie appears to be driving book sales," said Drew Crum, analyst with Stifel Nicolaus, in a note last week. "The Hunger Games" was first published in hardback in September 2008. The second in the trilogy, "Catching Fire" came out the next year, with the final book in the series, hitting bookstores in 2010. Between them there are 24 million copies of the three books in print in the United States alone. 0:00 / 2:17 What's the future for Harry Potter? Shares of theater operators have all had strong performances this year, as hopes for "The Hunger Games" and some other widely anticipated titles later this year like "The Avengers" "Dark Knight Rises" and the final "Twilight" movie have lifted hopes of a rebound after a down year in 2011, and some early missteps this year, such as Walt Disney's (DIS, Fortune 500) now historic bomb "John Carter." James Gross, analyst with Barrington Research who follows the sector, said that "The Hunger Games" is almost certain to have the best opening so far this year and might end up No. 1 for the year, given the pre-sale demand for tickets. "It was selling out the midnight shows a month ago," he said. Carmike Cinemas (CKEC) has been the best performer in the group, rising nearly 90% year to date, after gaining 15% this week. Shares of large screen theater operator IMAX (IMAX) are up 38% so far this year, while shares of the two other major publicly-traded theater chains -- Cinemark Holdings (CNK) and Regal Entertainment Group (RGC) -- have achieved more modest gains, but both are up nearly 19% so far this year.